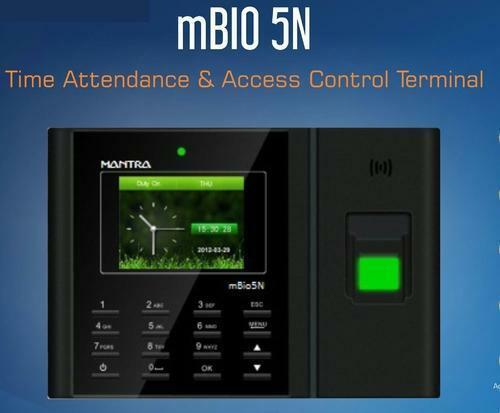 We are the authorized supplier of Mantra MBIO 5N Biometric Attendance and Door Access Control System. Mantra finger access control system serve dual purpose of time attendance recording and door access control security system. MBIO5N has a very high quality fingerprint scanner with 1000 user capacity colour display inbuilt battery backup and LAN port for computer software connectivity. CALL US FOR MORE INFORMATION ON MANTRA BIOMETRIC PRODUCTS.